(L to R) Katie Manning playing Mustardseed; Taylor Lahaise playing Peaseblossom; Leah Ravech playing Changeling Child; Chloe Pucci playing Moth; Olivia Price playing Cobweb. (L to R) Nicole Mulready playing Hermia; Marcus D'Angelo playing Lysander. 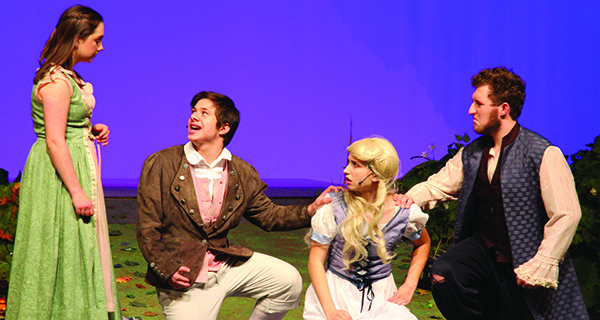 The Medfield High School Theatre Society presented a lively version of Shakespeare’s “A Midsummer Night’s Dream” on November 17 and 18 before a large audience Medfield High School’s Lowell Mason Auditorium. The play is set in an Athens forest and revolves around several versions of love: the pending marriages of Duke Theseus and Queen Hippolyta and Demetrius and Hermia, the love shared by Lysander and Hermia, the unrequited love of Helena for Demetrius, and the relationship between Oberon and Titania, King and Queen of the Fairies. Once King Oberon and Puck cook up a plot to bolster selected relationships with the use of a magical flower, and Puck makes some mistakes in the execution, the relationships are realigned, with farcical consequences. 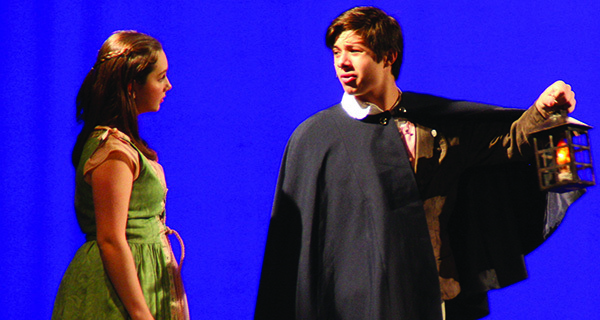 (L to R) Brice Sinnett playing Nick Bottom; Kate Davignon playing Titania. Enchanting music and dance enhanced this production and underscored the action at key points. Medfield High student Peter Travis mixed and produced instrumentals for Titania’s lullaby, which was performed with lyrics by William Shakespeare and set to the tune of “The Coventry Carol.” The Fairy Dance was composed by Peter Travis, and the dancing of Peaseblossom (Taylor Lahaise), Moth (Chloe Pucci), Mustardseed (Katie Manning), Cobweb (Olivia Price), and the Changeling Child (Leah Ravech) was entrancing. The Lovers, Helena (Molly Drumm), Demetrius (Michael O’Leary), Hermia (Nicole Mulready), and Lysander (Marcus D’Angelo), played their roles with loving sweetness and urgency, and handled the play’s physical conflicts and comedy well. The fairies created a dreamlike world with circular sweeping motions of their arms and bodies as they floated around the stage. They jumped between stage levels and playfully attended Queen Titania. 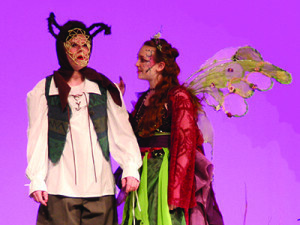 Puck (Anna DeBettencourt) excelled in her role as the impish jester who waited upon Titania and Oberon (Katie Predella). She glided around quickly on the stage and through the audience, reacted abruptly to others, and recited her lines with perfect merriment, laughter, and mischief. (L to R) Nicole Mulready playing Hermia; Marcus D'Angelo playing Lysander; Molly Drumm playing Helena; Michael O'Leary playing Demetrius. Nick Bottom (Brice Sinnett), Peter Quince (Harry Dorer), Francis Flute (Aidan Redding), Snug (Gabby Connelly), Tom Snout (Paul Narkewich), Robin Starveling (Minai Kini), and Gatebois (Caitlin Knight) had the audience laughing along with their unschooled and undisciplined antics in the “Pyramus and Thisbe” play within the play. The talented students of the Medfield Theatre Society will present “Big Fish” in March and Medfield After Dark in May. Put those productions on your calendar for a great night out!